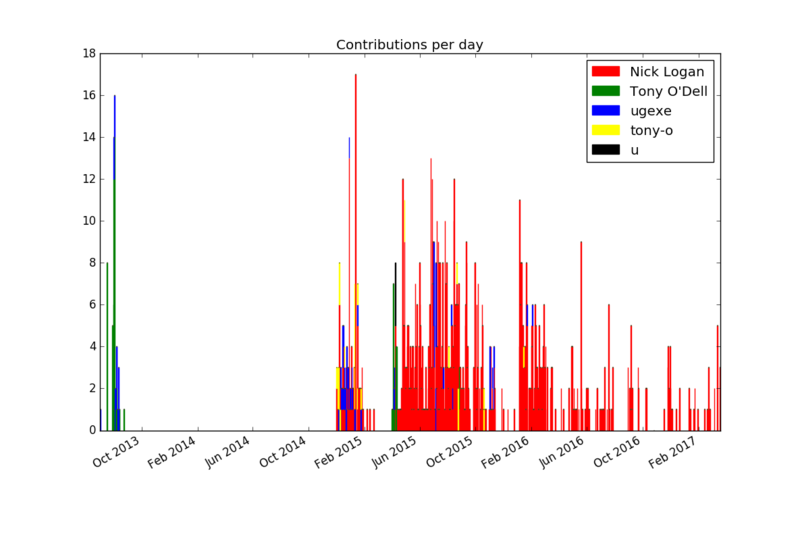 In a previous episode, we've explored plotting git statistics in Perl 6 using matplotlib. Since I wasn't quite happy with the result, I want to explore using stacked plots for presenting the same information. In a regular plot, the y coordiante of each plotted value is proportional to its value. In a stacked plot, it is the distance to the previous value that is proportional to its value. This is nice for values that add up to a total that is also interesting. Matplotlib offers a method called stackplot for that. Contrary to multiple plot calls on subplot object, it requires a shared x axis for all data series. So we must construct one array for each author of git commits, where dates with no value come out as zero. Comparing this to the previous visualization reveals a discrepancy: There were no commits in 2014, and yet the stacked plot makes it appear this way. In fact, the previous plots would have shown the same "alternative facts" if we had chosen lines instead of points. It comes from matplotlib (like nearly all plotting libraries) interpolates linearly between data points. But in our case, a date with no data points means zero commits happened on that date. The minmax method finds the minimal and maximal values, and returns them in a Range. Assigning the range to an array turns it into an array of all values between the minimal and the maximal value. The logic for assembling the @stack variable already maps missing values to zero. 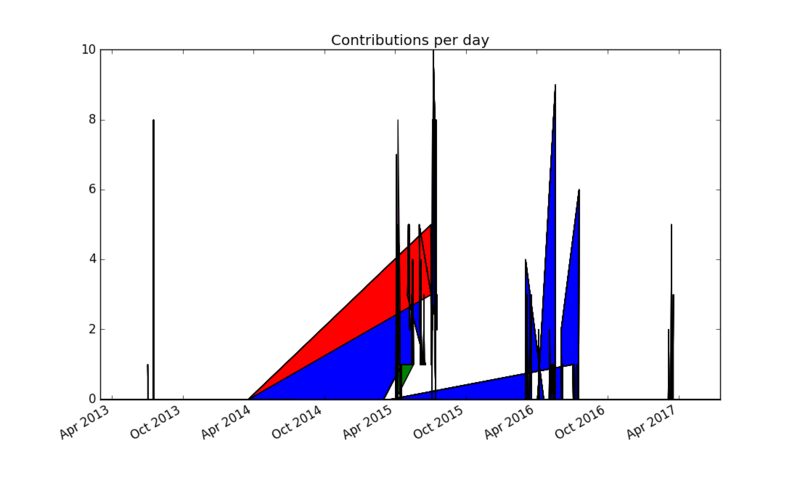 Thinking more about the problem, contributions from separate days should not be joined together, because it produces misleading results. Matplotlib doesn't support adding a legend automatically to stacked plots, so this seems to be to be a dead end. 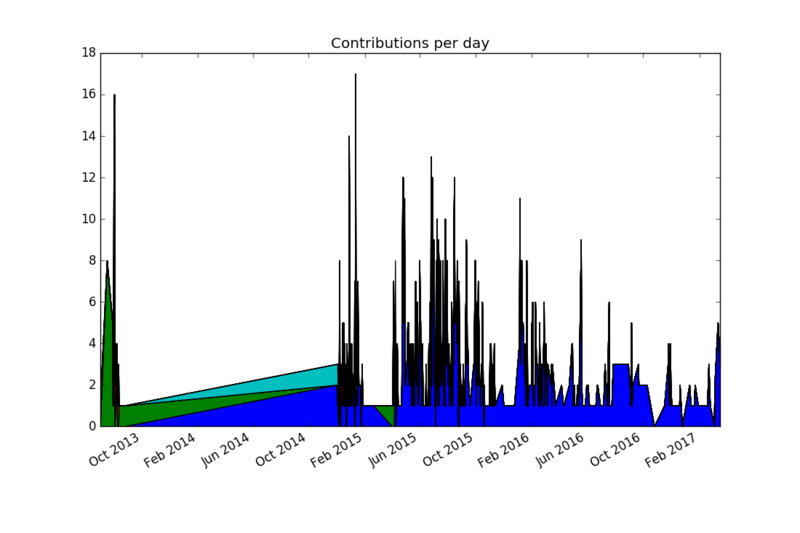 If you want to improve the result further, you could experiment with limiting the number of bars by lumping together contributions by week or month (or maybe $n-day period). 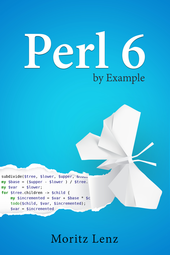 Next, we'll investigate ways to make the matplotlib API more idiomatic to use from Perl 6 code.